Simple and fun. 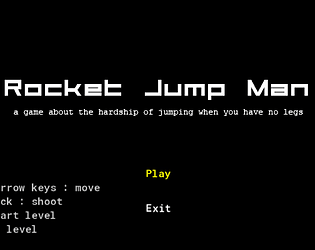 Good level design with the increasing difficulty and need to plan jumps and conserve rockets. Great mechanic. The tradoff between jumping and losing health is pretty cool! Epic mechanic. The scarcity of ammo and health pulled it all together. As you admit, the visuals and sound are a bit bland, but underneath the ugly skin is a really solid game. Good job! Gameplay was really fun! Just needed some flair with how it's presented, it's really boring to look at.